If you’re an athlete, it’s essential to think about keeping your body as neutral as possible as often as possible. 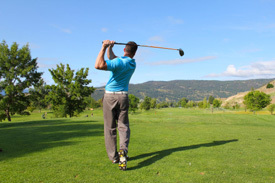 In sports like tennis, golf or hockey people who are right-handed tend to become right dominant, so they’ll overdevelop the right side of their body as opposed to the left side. That’s where injury or pain starts to happen. And everyday activities become challenging as they’re not able to use their body properly because one side is dominating and the other side isn’t firing properly. A person’s left arm may feel weak, and they don’t understand why it feels weak when doing the dishes and they’re playing tennis 4-5 times a week. I tell people even when they have an injury or are playing their sport stay in a neutral position and look at opposites. So if you’re right-hand dominant, you have to be sure to stretch and strengthen the left side. Let’s consider the effects of performing squats for example. If I don’t do those with individual legs as I’m training, my right side will dominate, and my left side’s not getting worked out. As a result, the problem will worsen because I would continue to build more and more strength in my right side and not fire my left side. It’s essential to focus and make sure that you’re activating all the muscles that you’re supposed to. You need to keep your body even. Opposites and neutral are keywords when it comes to making sure you’re keeping your whole body healthy to be able to prevent injury. By keeping your body neutral and strengthening the opposite side as you’re working out, you can avoid injury and perform better. At Restore Chiropractic, we love helping athletes get in the game and stay in the game. Book an appointment at our Main Line practice today!